At the risk of making this page look like an 'I HEART KANYE' lovefest, we got some good news for all y'all Ye fans. 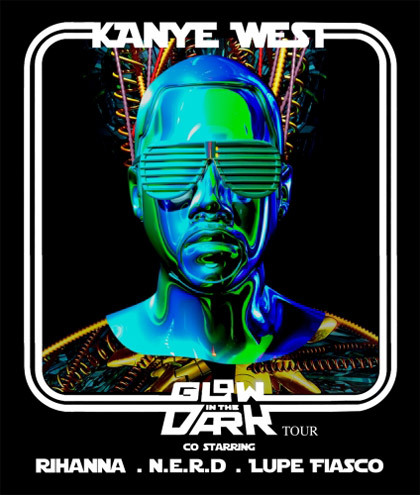 Looks like the graduate will be bringing his good life and the "Glow in the Dark" tour to L.A. Here's the list of places where he'll show up for some fake sh*t.
Yeah, you saw the sign right. We also like umbrella-ella-ellas, skaterboys, and superstars. YO! What if... nah... but... they were at that award show... YO! DAFT PUNK WILL BE THERE!!! Of course I'm kidding, but I'm also praying, wishing and dreaming. We might like Kanye (not as much as Kanye likes Kanye), but we love Daft Punk. Tickets go on sale Friday 2/15 at 10 am on ticketmaster. Here's the new (READ: creepy) "Flashing Lights" video while you wait to get your money right or, you know, wait for the tix to go on sale.